TILLSONBURG, Ont. -- Aluminum trailer manufacturer Titan Trailers has announced plans to build a new sub-assembly plant in Tillsonburg, Ont. Titan Trailer is opening a new sub-assembly plant in Tillsonburg, which will also house a welding school. TILLSONBURG, Ont. 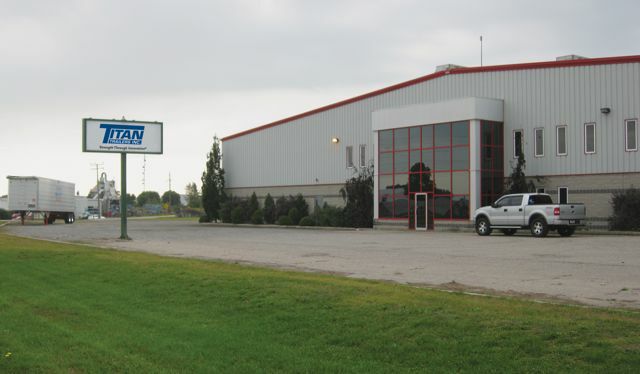 — Aluminum trailer manufacturer Titan Trailers has announced plans to build a new sub-assembly plant in Tillsonburg, Ont. The company, best known for its lightweight, extruded aluminum smoothside trailer bodies, is headquartered in Delhi, Ont. where it operates a 32,000 sq.-ft. facility housing its trailer finishing and engineering operations. Company officials say the new facility in nearby Tillsonburg offers 60,000 sq.-ft. of multi-purpose manufacturing space that’s well suited to the trailer manufacturer’s requirements. The new facility will be used primarily to receive running gear components such as axles, tires and suspension parts, which will be assembled to order on-site. The running gear sub-assemblies will then be shipped to the Delhi location for installation on trailer bodies, the company indicated. The new plant will also be used to install the moving floors on Titan’s self-unloading trailers. The new site is located at the junction of Hwy. 4 and Jackson Side Road, just six kilometres from the company’s head office. Titan also plans to open a new welding school on its new property. He notes that working almost exclusively on aluminum rather than steel is a new challenge for many welders, so the new program will provide welders with the skills needed by the manufacturer. The school will focus on fabricating with aluminum, with extra attention paid to reading and interpreting blueprints, the company says. Courses will be offered to students as a competitive trade school and successful graduates will have the chance to earn back their tuitions through employment at Titan. Finally, the new Tillsonburg location will include a retail walk-in counter, so local customers can purchase off-the-shelf trailer parts.